Welcome to Jaipur - contd. A stone observatory. Largest of Jai Singh’s five remarkable observatories. Its complex instruments,whose setting and shapes are scientifically designed, represent the high points of medieval Indian astronomy.The most striking of these are the Ram Yantras used for gauging altitudes. (Time 12.00 hrs to 19.00 hrs.) Pretty dolls from various countries are on display in the compound of the school for deaf and dumb children,near the Police Memorial. (Time 12.00 hrs to 19.00 hrs.) The Planetarium offers unique audio-visual education and entertainment with its modern computerized projection system. For school groups concessions are available. Closed on last Wednesday of every month. An ancient pilgrimage centre, lying beyond the gardens amidst low hills.Temples ,pavilions and holy kunds (natural spring and reservoirs) along with lush landscape make it a delightful spot. The small temple of the Sun god, built by Diwan Kriparam on the top of the highest peak is visible from all parts of the city. The exquisite jain temple on the Agra road has some of the most beautiful 19th century paintings in Jaipur style on its walls. The full-length exquisitely carve statue of Swai Jai Singh in white marble in the centre of the circle was erected under the newly planned scheme area to pay homage to the founder of Jaipur. Beautiful memorials to the queens,Maharani-ki-chattri are near the Ramgarh road crossing on the Amber Raod. The Island Palace,Jal Mahal built by Sawai Jai SinghI, is a fascinating spot at the centre of the Man Sagar Lake. The Kanak Vrindavan Complex of fine temples and gardens has been recently renovated to their pristine perfection. To the west of this road is the royal crematorium at Gaitore in a narrow valley with some spectacular cenotaphs of all the Jaipur rulers except Swai Ishwari Singh who was cremated outside the Jai Niwas Garden. Most imposing is the ‘chattri’ of Sawai Jai Singh II with the intricate carvings and a graceful shape. Ghat ki Guni: Beautifully landscaped gardens, laid out in the 18th and 19th century by king and courtiers dot the narrow gorge in the south eastern corner of the walled city, along the road to Agra. 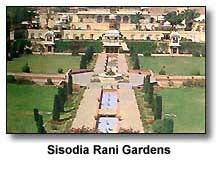 Sisodia Rani Garden has tiered multilevel gardens with fountains, water channel and painted pavilions and suites of living rooms. Amongst others, Vidhyadhar-ka-Bagh is the best preserved one, with shady trees, flowing water, an open pavilion. It was built by the planner of the city,Vidhyadhar. Former capital of the Kachhwaha rulers of the old state of Dhundhar for seven centuries. Very little of the early structures survive now. 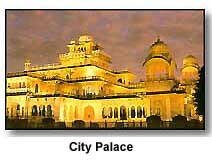 Amer Palace and Shila Mata Temple: A beautiful complex of palaces, halls,pavilions,gardens and temples built by Raja Man Singh,Mirza Raja Jai Singh and Sawai Jai Singh over a period of about two centuries still stand in magnificent state. The palace complex emerges dramatically from the placid waters of the Maotha Lake and is approachable only through a steep path. Tourists often ride on the elephant back to the Singh pol and the Jaleb Chowk. Two flights of stairs rise from on end of the chowk, one leading to the Shila Mata Temple and other to the palace complex. The image of the patron of goddess,worshipped by thousands of deovtees, was brought from Jessore in East Bengal (now in Bangladesh) by Raja Man Singh, to be installed here. A spectacular pillared hall -Diwan-e-Aam and a double storeyed painted gateway. Ganesh Pole dominate the from courtyard, An elegant tiny garden in Charbagh style beyond th corridors, has Sukh Niws to its right and Jas Mandir to its left. The latter combines the Mughal and Rajput architecture seen in its beautiful interior with intricately carved Jali screens,delicate mirror and stucco work and painted and carved dadoes. The well proportioned Mohan Bari or Kesar Kyari in the centre of the Maotha Lake and the Dilaram Bagh at its north end provides a spectacular view of the palaces above. Old City: Once a settlement of nobles,craftsmen and common folks, the city of Amer is now in ruins. The remanants of its rich past are the beautifully carved and planned Jagat Shiromani Temple, a Krishna temple associated with Meerabai, an ancient temple of Narsinghji and a magnificent step-well,Panna Mian-ka-kund. Jaigarh: One of the few military structures of medieval India, retaining its ancient splendour in palaces,gardens , reservoirs, a granary, an armoury, a well planned cannon foundary, several temples, a tall tower and a giant mounted cannon-the Jai Ban,one of the largest in the country are preserved here. The extensive parkotas (wallls), watch tower and gateways of Jaigarh dominate the western skyline. 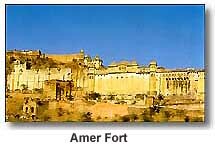 Nahargarh: A sentinerl to the Pink City is Nahargarh Fort, situtated beyond the hills of Jaigarh. Although much of it is in ruins, the lvoerly building added by Sawai Ram Singh II and Sawai Madho Singh II provides interest to the fort. Samod (40 km, north west): The beautiful Samode Palace, has been rebuilt and renovated and provides a fine example of the Rajput haveli architecture and is an ideal spot for outings. Bairath(86 km on the Shahpura-Alwar Road): An important historical place with the excavated remains of a circular Buddhist temple-unique in Rajasthan and the earliest known temple in India. Bairath also has relics of the Mauryan,Mughal and Rajput periods. Jaisinghpura Khor (12 km off the Amer Road): One of the settlement of the Meena tribe, it has a formidable fort, a jain temple and a step-well amid lush surroundings.